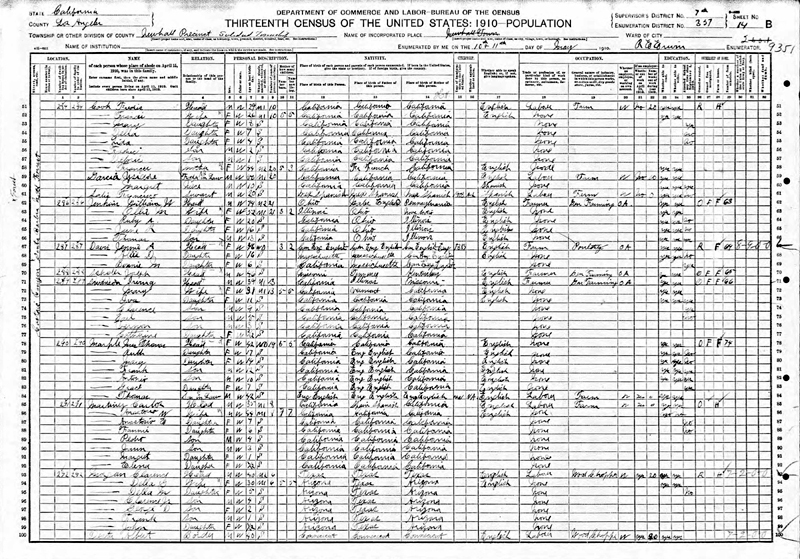 1910 U.S. Census for "Castaic Canyon, Santa Barbara National Forest" in Soledad Township, Newhall Precinct, showing the Fred and Frances Cook (Cooke) household and the William W. Jenkins household. Additional unrelated surnames include Davis, Schuler(? ), Davisdon, Marple, Martinez and Morgan(?). Chief Frances Garcia Cooke (and her descendants) trace their lineage to Native Americans who lived at Chaguayabit village (Castaic Junction) prior to European contact in 1769, and Fred Cooke also descends from Indians living in what became Los Angeles County. Frances inherited the title of chief from her father, Chief Isodoro Garcia who, as shown here, lived with Fred and Frances in 1910, along with his granddaughter Margaret S. Rivera (Garcia), who would marry Eldridge Ward in 1914. Fred and Frances added the "e" to Cook. William Wirt Jenkins is the rancher who famously feuded with neighbor William Chormicle. As indicated here, the Cooks and Jenkins lived on neighboring ranches. (Names are listed in order of "visitation" by the Census taker. If they had house numbers, they would be shown in the left-hand column, but they didn't.) Jenkins' ranch eventually became the Stonegate subdivision in Castaic. More than neighbors, the Cooks aligned with the Jenkins during the troubled times. Fred Cook's father, Dolores Cook, was killed by Chormicle and an ally in 1890 while Dolores was in Jenkins' employ. Fred's mother, Francis Olme Cook (widow of Dolores) also lived with Fred and Frances in 1910. Francis Olme Cook is the only Cook listed here with a parent who wasn't born in California; it says her father (Antoine/Antonio Olme) was born in France (another document says Belgium). The 1-year-old Dolores listed here is Simon Dolores "Cy" Cooke, who became the father of Chief Charlie Cooke — who inherited the title of chief from his aunt Mary, Cy's sister. Frederick S. Cook, head of household, age 29. Frances Cook, wife, age 26. Mary Cook, daughter, age 8. Della Cook, daughter, age 7. Lida (aka Lydia) Cook, daughter, age 4. Fredric Cook, son, age 2. Dolores (Deloris?) Cook, son, age 1. Francis (Olme) Cook, mother, age 44. Ysidore (Ysidoro) Garcia, father-in-law, age 50. Margaret (Rivera) Garcia, niece, age 10. Francisco Solis(? ), a servant, age 20. William W. Jenkins, head of household, age 74. Ollie M. (aka Olive Roades) Jenkins, wife, age 52. Ruby A. Jenkins (later Kellogg), daughter, age 20. June K.(?) Jenkins (later Kinler), daughter, age 16. Thomas Jenkins, son, age 13. LW2660: 19200 dpi jpeg | Online image only.